1000 Blog Visits, Thank you Readers! I’m celebrating 1000 Visits in 2 ways. 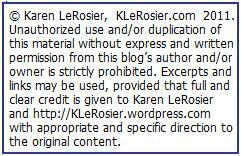 The old URL http//KLeRlosier.wordpress.com will still bring you to the blog. 2. Naming my Kindle Character. I’ve decided on an official version and ‘m asking the people who got me to my goal of 1000 visits to name him. Please share what you think he/she should be named in a comment. I prefer reading on my Kindle over a printed book. (see Top Ten Reasons I love My Kindle post) But there are some books that just belong in printed book format. Kid’s books dominate the list with books that provide texture, attached parts and even aromas. Another issue is size does mater, some books need to be large. I hope these books will always be available on paper. What good is a yearbook without silly saying and autographs from classmates in the borders 2 good 2B 4gotten. For obvious reason yearbooks are not available at Amazon in any format. What books would you have included on this list? Book 5 in the Cassie Palmer series. (finished over the weekend.) I love this series. They tend to begin mid-harrowing action and keep going and this one might be the most action packed. I found myself thinking alright! Enough disaster has befallen Cassie, let her up for air–and let the reader find a good pace to set the book down so they can sleep. The series is about Cassie a young woman who finds herself suddenly put in a position of power with powerful magical abilities but without the instruction manual or training. She is also surrounded by powerful people who are willing to help her but also want to control her as well as those who want to destroy her. In each book she learns to control more of her abilities (trial and error mostly) and grows into her role more. Karen Chance has created a large cast of unusual quirky characters. My favorites include John Pritkin, her war mage bodyguard and Billy her symbiotic ghost companion and sometimes rescuer. A rather unique feature on Karen Chance’s website is a gallery with beautiful illustrations of her characters. In the July 4th Top Ten List post an IOU was offered for 2 authors since there were only eight members of the Kindle Million Club. I predicted the ninth and tenth members would be announced by the end of July. I was 16 days short. On August 16th Amazon announced that Janet Evanovich and Kathryn Stockett had sold their millionth paid ebook from the Kindle Store and became members of the Kindle Million Club. Best known for her Stephanie Plum novels, Evanovich’s latest release, Smoking Seventeen has been on the Kindle Best Seller list over three months. Stockett’s place in the Million Club was earned with her first novel, The Help. Stockett is the first debut novelist to join the Kindle Million Club Wow! The author of the Donavan Creed novels and Emmett Love Novels, Locke is the author of a new non-fiction book, How I Sold 1 Million eBooks in 5 Months. The author of Crime Novels, Harry Bosch and Mickey Haller Series. The author of the Fantasy series The Underland Chronicles and Science Fiction trilogy The Hunger Games. The author the Jack Reacher Novels.